This article is about the Childish Gambino song. For other songs of this name, see This Is America. "This Is America" is a song by American rapper Childish Gambino. Written by Donald Glover, Ludwig Göransson, and Jeffery Lamar Williams, and produced by Glover and Göransson, it was released on May 5, 2018, at the same time that Gambino was hosting that day's episode of Saturday Night Live. The song features background vocals by American rappers Young Thug (who also has writing credit as Williams), Slim Jxmmi, BlocBoy JB, Quavo, and 21 Savage. The song addresses the wider issue of gun violence in the United States, the high rate of mass shootings in the United States, along with longstanding racism and discrimination against African Americans. The song's accompanying music video was directed by Japanese-American filmmaker Hiro Murai, a frequent Gambino collaborator. According to RCA Records, the song is not the first single from Gambino's upcoming studio album. "This Is America" became the 31st song to debut at number one on the US Billboard Hot 100, becoming both Gambino's first number one and top ten single in the country. It has also topped the charts in Australia, Canada, and New Zealand. The song won in all four of its nominated categories at the 61st Annual Grammy Awards: Record of the Year, Song of the Year, Best Rap/Sung Performance and Best Music Video. This made Gambino the first hip-hop artist to win Record of the Year and Song of the Year, and "This Is America" the first rap song to win these awards. The song features a gospel-style choir and background contributions from various American rappers. Young Thug, Slim Jxmmi, BlocBoy JB, 21 Savage and Quavo each deliver an ad-lib. Young Thug returns to supply the song's outro. The lyrics primarily address being black in the United States and gun violence in the country. It also touches on police brutality. Pitchfork's Stephen Kearse described the song as a representation of the "tightrope of being black", with the song "built on the sharp contrast between jolly, syncretic melodies and menacing trap cadences". Media outlets reported that a number of listeners accused Gambino of plagiarism over "This Is America", pointing out the similarities between the song and "American Pharaoh" by Jase Harley. CBS News stated, "The tracks have a similar sound, and share similar themes in the lyrics." Harley stated that he felt "This Is America" was influenced by his song, but that he does not have an issue with it. Glover's manager, Fam Rothstein, denied any plagiarism. The music video was directed by Hiro Murai and released on YouTube simultaneously with Gambino's performance of the song on Saturday Night Live. The video received about 12.9 million views in 24 hours, and has over 500 million views as of February 2019. In an interview with the New York Times, Murai discussed his upcoming season for Atlanta, a show involving Gambino. He stated, "There's sort of a world-weariness in both this season and the music video. They're both reactions to what's happening in the world." The video contains a lot of scenes involving violence. It starts off with Gambino dancing through a warehouse, interacting with a series of chaotic scenes. According to Murai, the video was inspired by the films Mother! and City of God. Choreographed by Sherrie Silver, Gambino and his entourage of young dancers perform several viral dance moves including the South African Gwara Gwara and "Shoot" popularized by BlocBoy JB, who is one of the ad-lib contributors on the song. Gambino's dancing is contrasted against moments of violence. Only 53 seconds into the video, Gambino shoots a man in the back of the head with a handgun, while assuming a comical stance similar to a Jim Crow caricature. The first person depicted as being shot in the video, a guitarist who had been accompanying Gambino's singing up to that point, was musician Calvin the Second, but was initially mistaken by many viewers to be the father of 17-year-old gun violence victim Trayvon Martin. 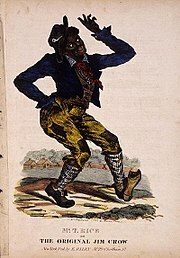 This first shooting also marks a transition in the music, from an African "folk-inspired melody" to "dark, pulsing trap". At a later point, Childish Gambino uses a Kalashnikov patterned automatic weapon to gun down a church choir, which viewers have interpreted as a reference to the 2015 Charleston church shooting. In both instances, a child appears from off-screen holding a red cloth, on which Gambino gently lays the weapon used, while the bodies are simply dragged away, which viewers have interpreted "as a reference to Americans' willingness to protect gun rights over people". Scenes also involved children using their cell phones to record the chaos happening in the video, while Gambino sings the lyrics "This a celly / That's a tool". Martha Tesema, writer for website Mashable, stated that "cell phones have been used as tools to broadcast police shooting, rioting against, or choking black people in this country". Throughout the video, numerous vehicles from several decades ago are featured, many of them with their hazard lights flashing and the driver's side door ajar, which critics interpreted as representing fatal police shootings during traffic stops, particularly the shooting of Philando Castile, who was shot while in a 1997 Oldsmobile; others have interpreted that the older model cars represent the relative lack of upward mobility of African Americans. American singer SZA makes a cameo appearance towards the end of the video, seated atop one of these vehicles. The video ends with Gambino in a darkened portion of the warehouse, fearfully running towards the camera while being chased by several white people. Viewers have said this resembles scenes from the 2017 film Get Out. He's talking about the contradictions of trying to get money, the idea of being a black man in America. It comes out of two different sound worlds. Part of the brilliance of the presentation is that you go from this happy major mode of choral singing that we associate with South African choral singing, and then after the first gunshot it moves right into the trap sound. Will Gompertz, arts editor of the BBC, asserted that "This Is America" was a "powerful and poignant allegorical portrait of 21st Century America, which warrants a place among the canonical depictions of the USA from Grant Wood's American Gothic to Edward Hopper's Nighthawks, from Emanuel Leutze's Washington Crossing the Delaware to America the Beautiful by Norman Lewis". In December 2018, Billboard ranked "This Is America" as the 6th best song of the year. The music video won the International Film Festival of the Art of Cinematography Camerimage Award for Best Cinematography in a Music Video, as well as the Grammy Award for Best Music Video at the 61st Grammy Awards. It won more awards as shown below. Glover hosted the May 5 episode of the 43rd season of Saturday Night Live, and performed two new songs as Childish Gambino on the same episode, the second of which was "This Is America". Daniel Kaluuya, best known as the star of the film Get Out which the music video reportedly references, introduced the song's performance. Several artists attracted attention and millions of views for creating covers of the song and music video with altered lyrics and themes, retaining the song's instrumental and the general structure of its music video. Nigerian rapper Falz released "This Is Nigeria" on May 25, highlighting the nation's issues with corruption and organized crime among others. The music video also spawned popular Internet memes, particularly those in which the audio was replaced so that Childish Gambino appeared to be dancing in time to another song. Versions using Carly Rae Jepsen's "Call Me Maybe" and Earth, Wind & Fire's "September" were some of the most viewed. The song is interpolated into a scene in the film Guava Island. "This Is America" debuted at number one on the US Billboard Hot 100, becoming the 31st song to do so in the chart's history. It debuted with 78,000 downloads sold and 65.3 million US streams in the first week. Its music video accounted for 68% of the song's streaming total. "This Is America" is also Gambino's first top 10; he previously reached number 12 in August 2017 with "Redbone". "This Is America" overtook Drake's "Nice for What" from the top position for two weeks. Gambino is also the second Emmy Award-winning actor to reach number one on the Hot 100, the first being Justin Timberlake, who topped the chart with "Can't Stop the Feeling!" in 2016. It topped the Hot 100 for two weeks, and left the top ten after five weeks. Credits are adapted from Tidal. ^ Cornish, Audie (May 7, 2018). "Donald Glover's 'This Is America' Holds Ugly Truths To Be Self-Evident". NPR. Retrieved May 9, 2018. ^ Jenkins, Craig (May 17, 2018). "The Internet Has Already Devoured 'This Is America'". Vulture. Retrieved May 20, 2018. The same night he dropped off the video for "This Is America," a combination trap and afrobeat banger with a beguiling message about race and gun violence. ^ a b "This Is America / Childish Gambino". Tidal. Retrieved May 7, 2018. ^ "61st Annual GRAMMY Awards". GRAMMY.com. 6 December 2018. ^ Arcand, Rob (May 6, 2018). "Childish Gambino Debuts Politically-Charged New Song "This is America" on SNL: Watch". Spin. Retrieved May 7, 2018. ^ a b Guan, Frank (May 7, 2018). "What It Means When Childish Gambino Says 'This Is America'". Vulture. Retrieved May 7, 2018. Mitchell, Peters (May 6, 2018). "Childish Gambino 'This Is America' Reactions: The Good, The Bad & The Kanye Bashing". Billboard. Retrieved May 7, 2018. Lefevre, Jules (May 7, 2018). "Hello, Childish Gambino Just Dropped The Music Video Of The Year". Junkee. Retrieved May 7, 2018. ^ a b c Kornhaber, Spencer (May 7, 2018). "Donald Glover Is Watching You Watch Him". The Atlantic. Retrieved May 7, 2018. ^ a b "Childish Gambino Releases New Song And Video "This Is America" - RCA Records". RCA Records. May 6, 2018. Retrieved May 7, 2018. ^ a b Russell, Scott (May 6, 2018). "Childish Gambino Makes His Triumphant Return with "This Is America," "Saturday"". Paste Magazine. Retrieved May 7, 2018. ^ "2019 GRAMMY Awards: Complete Nominations List". 7 December 2018. Retrieved 26 December 2018. ^ Espinoza, Joshua (May 6, 2018). "Here Are the Rappers Who Contributed to Childish Gambino's "This Is America"". Complex. Retrieved May 8, 2018. ^ Tesema, Martha (May 6, 2018). "Donald Glover tackles gun violence in powerful video for 'This Is America,' his new single". Mashable. Retrieved May 7, 2018. ^ Holland, Jesse J. (May 9, 2018). "'This Is America' seals Glover's rep as protest artist". AP News. Retrieved May 10, 2018. ^ France, Lisa Respers (May 7, 2018). "'This Is America': The Childish Gambino video explained". CNN. Retrieved May 8, 2018. ^ a b ""This Is America" by Childish Gambino Review | Pitchfork". pitchfork.com. Retrieved May 11, 2018. ^ Strauss, Matthew (June 25, 2018). "Childish Gambino Collaborator Denies "This Is America" Plagiarism Allegations". Pitchfork. Retrieved June 28, 2018. ^ Miller, Kai (June 25, 2018). "Childish Gambino Accused of Ripping Song for "This Is America"". XXL. Retrieved June 28, 2018. ^ Park, Andrea (June 26, 2018). "Childish Gambino's manager denies accusation of plagiarism over "This is America"". CBS News. Retrieved June 28, 2018. ^ Klein, Jessica (May 9, 2018). "Childish Gambino's "This Is America" Clocks 55 Million Views In Just Four Days". www.tubefilter.com. Retrieved 2019-01-08. ^ Coscarelli, Joe (2018-05-10). "Hiro Murai on the 'Atlanta' Finale and 'This Is America' Video". The New York Times. ISSN 0362-4331. Retrieved 2019-01-08. ^ Sharf, Zack; Sharf, Zack (2018-05-11). "'This Is America' Director Hiro Murai Shares Video Influences: 'City Of God' Meets the Last 20 Minutes of 'mother!'". IndieWire. Retrieved 2019-01-08. ^ Amoako, Aida (2018-05-08). "Why the Dancing Makes 'This Is America' So Uncomfortable to Watch". The Antlantic. Retrieved 6 February 2019. ^ Kreps, Daniel (May 6, 2018). "Watch Childish Gambino's Caustic Video for New Song 'This Is America'". Rolling Stone. Retrieved May 7, 2018. ^ "The 100 Greatest Music Videos of the 21st Century: Critics' Picks". Billboard. July 24, 2018. Retrieved July 24, 2018. ^ Gajanan, Mahita (May 7, 2018). "An Expert's Take on the Symbolism in Childish Gambino's Viral 'This Is America' Video". Time. Retrieved May 24, 2018. ^ Gompertz, Will (12 May 2018). "Will Gompertz reviews Childish Gambino's This is America video". BBC News. Retrieved 29 December 2018. ^ "Billboard's 100 Best Songs of 2018: Critics' Picks". Billboard. Retrieved 13 January 2019. ^ "EnergaCAMERIMAGE 2018 WINNERS – Camerimage 2018". camerimage.pl. Retrieved 2019-01-08. ^ Baumgartner, Scott (May 6, 2018). "'SNL': Childish Gambino Delivers 'This Is America' With Intro By 'Get Out's Daniel Kaluuya". Hollywood Life. Retrieved June 4, 2018. ^ "This Is America: Breaking down Childish Gambino's powerful new music video". The Sydney Morning Herald. May 9, 2018. Retrieved June 4, 2018. ^ "YouTuber defends Gambino 'women's edit'". BBC. May 16, 2018. Retrieved June 4, 2018. ^ Ernst, Douglas. "Nicole Arbour's feminist makeover of Childish Gambino's 'This is America' sparks backlash". The Washington Times. Retrieved June 4, 2018. ^ "The hit "This is Nigeria" video tackles the country's worst problems one reference at a time". QZ. Retrieved June 4, 2018. ^ "Nigerian Rapper Goes Viral With His Take On 'This Is America'". NPR. Retrieved June 4, 2018. ^ Rosenberg, Adam. "You can't shut down 'This Is America' memes. That's what 'This Is America' is about". Mashable. Retrieved June 4, 2018. ^ "Childish Gambino's "This is America" x "Call Me Maybe" Mashup". Highsnobiety. June 4, 2018. Retrieved June 4, 2018. ^ Trust, Gary (May 14, 2018). "Childish Gambino's 'This Is America' Is No. 1 On The Billboard Hot 100". Billboard. Retrieved May 15, 2018. ^ "Australian-charts.com – Childish Gambino – This Is America". ARIA Top 50 Singles. Retrieved May 19, 2018. ^ "Austriancharts.at – Childish Gambino – This Is America" (in German). Ö3 Austria Top 40. Retrieved May 23, 2018. ^ "Ultratop.be – Childish Gambino – This Is America" (in Dutch). Ultratop 50. Retrieved June 1, 2018. ^ "Ultratop.be – Childish Gambino – This Is America" (in French). Ultratip. Retrieved June 1, 2018. ^ "Childish Gambino Chart History (Canadian Hot 100)". Billboard. Retrieved May 15, 2018. ^ "ČNS IFPI" (in Czech). Hitparáda – Digital Top 100 Oficiální. IFPI Czech Republic. Note: Change the chart to CZ – SINGLES DIGITAL – TOP 100 and insert 201821 into search. Retrieved May 21, 2018. ^ "Track Top-40 Uge 20, 2018". Hitlisten. Retrieved May 23, 2018. ^ "Lescharts.com – Childish Gambino – This Is America" (in French). Les classement single. Retrieved May 19, 2018. ^ "Offiziellecharts.de – Childish Gambino – This Is America". GfK Entertainment Charts. Retrieved May 18, 2018. ^ "Archívum – Slágerlisták – MAHASZ" (in Hungarian). Single (track) Top 40 lista. Magyar Hanglemezkiadók Szövetsége. Retrieved May 20, 2018. ^ "Archívum – Slágerlisták – MAHASZ" (in Hungarian). Stream Top 40 slágerlista. Magyar Hanglemezkiadók Szövetsége. Retrieved May 26, 2018. ^ "IRMA – Irish Charts". Irish Recorded Music Association. Retrieved May 19, 2018. ^ "Japanese Top Music". Billboard. Retrieved May 27, 2018. ^ "Top Singoli – Classifica settimanale WK 20" (in Italian). Federazione Industria Musicale Italiana. Retrieved May 19, 2018. ^ "Nederlandse Top 40 – week 21, 2018" (in Dutch). Dutch Top 40 Retrieved May 26, 2018. ^ "Dutchcharts.nl – Childish Gambino – This Is America" (in Dutch). Single Top 100. Retrieved May 18, 2018. ^ "NZ Top 40 Singles Chart". Recorded Music NZ. May 21, 2018. Retrieved May 18, 2018. ^ "VG-lista – Topp 20 Single uke 20, 2018". VG-lista. Retrieved May 19, 2018. ^ "Portuguesecharts.com – Childish Gambino – This Is America". AFP Top 100 Singles. Retrieved June 6, 2018. ^ "Official Scottish Singles Sales Chart Top 100". Official Charts Company. Retrieved May 12, 2018. ^ "ČNS IFPI" (in Slovak). Hitparáda – Singles Digital Top 100 Oficiálna. IFPI Czech Republic. Note: Select SINGLES DIGITAL - TOP 100 and insert 201820 into search. Retrieved May 21, 2018. ^ "Top 100 Canciones – Semana 20: del 11.05.2018 al 17.05.2018" (PDF) (in Spanish). Productores de Música de España. Retrieved May 23, 2018. ^ "Sverigetopplistan – Sveriges Officiella Topplista". Sverigetopplistan. Retrieved May 18, 2018. ^ "Swisscharts.com – Childish Gambino – This Is America". Swiss Singles Chart. Retrieved May 21, 2018. ^ "Official Singles Chart Top 100". Official Charts Company. Retrieved May 19, 2018. ^ "Childish Gambino Chart History (Hot 100)". Billboard. Retrieved June 2, 2018. ^ "Childish Gambino Chart History (Hot R&B/Hip-Hop Songs)". Billboard. Retrieved June 2, 2018. ^ "Childish Gambino Chart History (Rhythmic)". Billboard. Retrieved June 26, 2018. ^ "2018 International Singles Chart of Galgalatz and Walla". Walla. Retrieved December 31, 2018. ^ "Hot R&B/Hip-Hop Songs – Year-End 2018". Billboard. Retrieved December 5, 2018. ^ "ARIA Australian Top 50 Singles". Australian Recording Industry Association. June 25, 2018. Retrieved June 23, 2018. ^ "New Zealand single certifications – Childish Gambino – This Is America". Recorded Music NZ. Retrieved June 15, 2018. ^ "Polish single certifications – Childish Gambino – This Is America" (in Polish). Polish Society of the Phonographic Industry. Retrieved October 7, 2018. ^ "American single certifications – Childish Gambino – This Is America". Recording Industry Association of America. Retrieved December 20, 2018. If necessary, click Advanced, then click Format, then select Single, then click SEARCH. ^ "Top 40/Rhythmic". All Access Music Group.